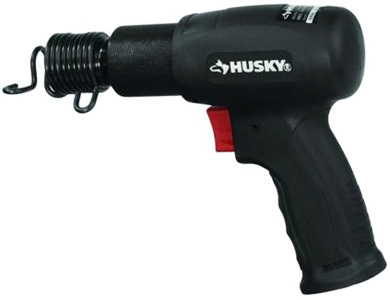 Husky Medium Stroke Air Hammer is the one of the most popular air hammers on the market. It has a quite good balance between quality and price. Air Hammer is indispensable air tool for such operations like dismantling of building construction. Electrical and gasoline analogs have a quite heavy motor which reduces the usability of the this tool. Therefore, if you have air compressor then Husky Medium Stroke Air Hammer will be the most convenient and effective tool among the analogs. You can use it at high humidity and dust levels without any problem. Removing asphalt or loosening dense ground. At home of course we use it mostly for repair, dismantling of tiles and other construction works. With this Husky air hammer you can cutting metals, removing tiles from walls or floors, shearing rivets and bolts, etc.. And all these tasks can be done easily and naturally, because it doesn’t require a lot effort. Unfortunately, it comes without any chisel, so you should buy additional one if you haven’t it before. Luckily you can use Husky H4630 model with any standard chisels with size of shank 0.401 inches. Well you can use this tool with such air compressors but you must understand that this is a continuous operation tool which require enough amount of compressed air. So this Husky Air Hammer will only works for about 30 second on a 4.6 gal air compressor. It is recommended to to use at least 20 gallon air compressor for such tools. Overall this is an awesome and at the same time very cheap tool which definitely will be useful for a lot of tasks at home. If you want to write a Review about this product or share your experience you can use the form below.